Sweet Christmas Day arrived in style! Christmas Day arrived early on Saturday 8th December with our sell-out ‘Missie Cindz PudInn Club’ afternoon – serving diners a delicious taste of Christmas in five sweet courses! A big thank you to our five guest chefs and bakers who pulled out the stops to with their generous and delightful festive pudding courses – all capturing the festive tastes of a season of merriment and bliss in their own unique way. For those who aren’t sure what ‘Missie’s Pud Inn’ Clubs are (aka #MissiesPudInn). Pud Inn is Sheffield’s sweetest toothed open dining club, and it’s where the only thing on our menu are puddings! Yes, Pud Inn (pudding) is rather naughty and unhealthy but I think everyone’s allowed a guilty pleasure once in a while – after all – what’s life without treats!? Let's get the Missie Cindz Christmas Party staaaaaaaarted! 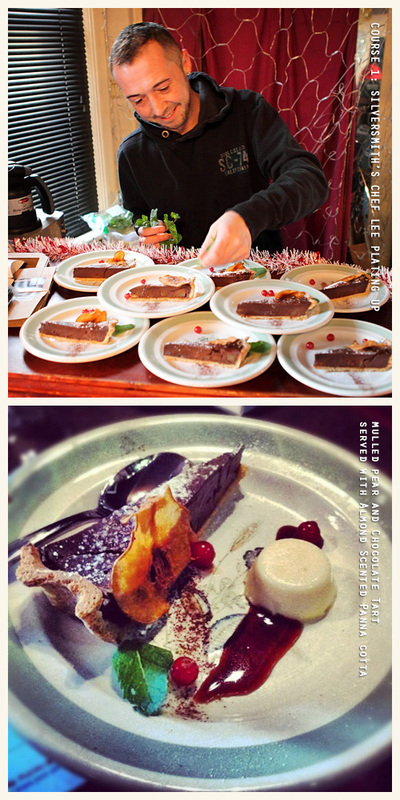 I like to add touches of Missie-ness to the event, so I include ‘Score and Comments’ sheets to get diners talking and interacting with their five puds, along with a sweet Pud Inn Christmas quiz so diners can work in their table teams to win prizes. 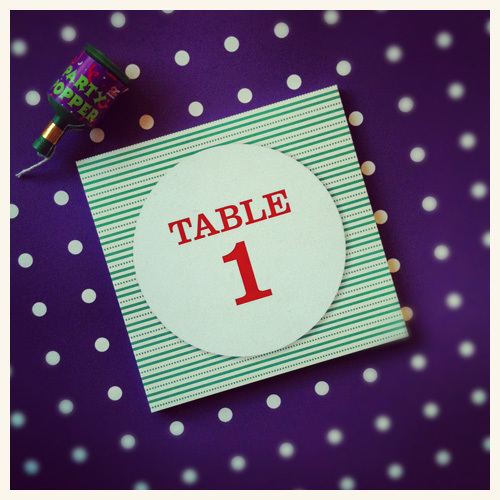 This time round, I knew I also wanted to also include a ‘Not-so-secret Santa Desserts Table‘ – this was a table where diners could voluntarily bring in festive homemade or shop bought treats for us all to try – the little details and touches like these I bought into the day’s event, I hope helped to add a playful and charming touch to Pud Inn. Course One: first up was Silversmith’s Creative Chef, Lee Mangles (@leesimonmangles) serving us a festive Mulled Pear and Chocolate Tart served with Almond Scented Panna cotta. I first met and got in touch with Lee properly at my EPIC tea party night in Endcliffe Park Cafe back in September, plus I’ve tried Lee’s desserts before after a few enjoyable meals in Silversmiths. So after that, I knew I wanted Chef Lee involved in Pud Inn Club. It was fantastic having Lee sat in with us for the first half of the event – soon after that he was called in to Silversmiths for their evening service, but I was still really pleased he could join us. Having the food producers and chefs sat in with us plays an important element to why Pud Inn happens and its success. Next up was course 2. 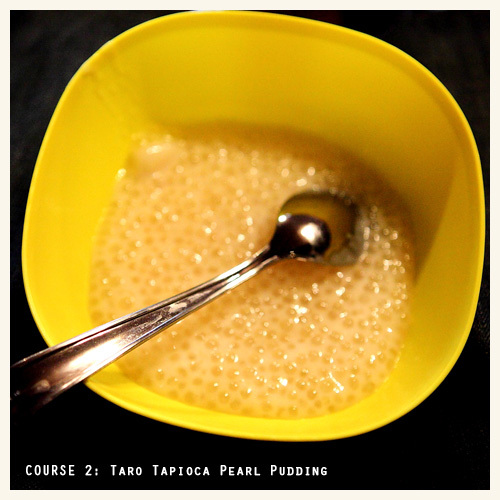 ‘Snowy’ Taro Tapioca Pearl Pudding made by my mum, Lin. This course is a traditional creamy Chinese soup-based dessert. Most Chinese and cafe-style restaurants will offer this kind of dessert soup at the end of your meal (usually complimentary too). To me, it is so yummy! and we thought it would be lovely for our diners to try it too. The tapioca pearls also look like mini snowballs and its creamy whiteness looked perfect for our festive Pud Inn theme! 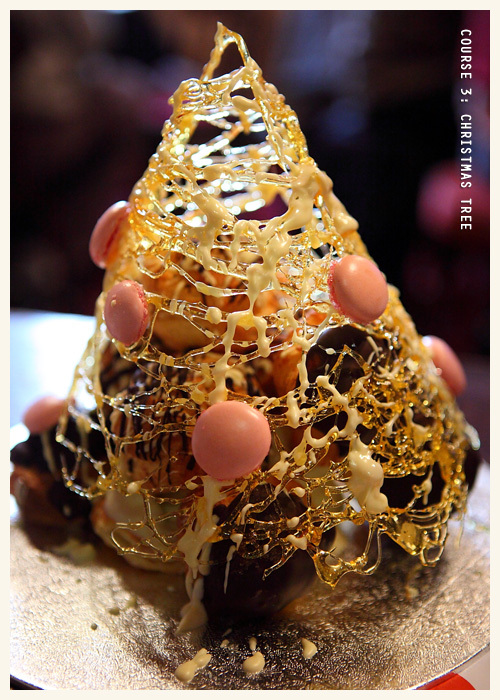 Next up was Course 3: the Rutland Arms’s Chef Mike’s Christmas Tree, and stunning trees they were too! I dread to think the amount of time he spent on his course. Amazing stuff. Next up was Course 4: Grandma Vera’s Christmas Trifle served in delightful looking teacups made by enthusiastic cake lovers, Honey Pie Tearoom. I first met Jo of Honey Pie Tearoom a few months ago when I found out that their cosy tearoom on Chesterfield Road, Sheffield held Pudding Fridays – where every Friday they would serve up a pudding favourites to the public. So with us having lots in common already, I had the perfect reason to ask Jo and her team to take in #MissiesPudInn. Their pudding course went down really well with the diners! Jo tells me a little more about her pudding course…“It was named and dedicated to my granny who I owe my best Christmas memories to. I used to sit on the worktop while she made the trifle and eat the sponge fingers.The chocolate coins and sugared almonds epitomised Christmas when I was a child! 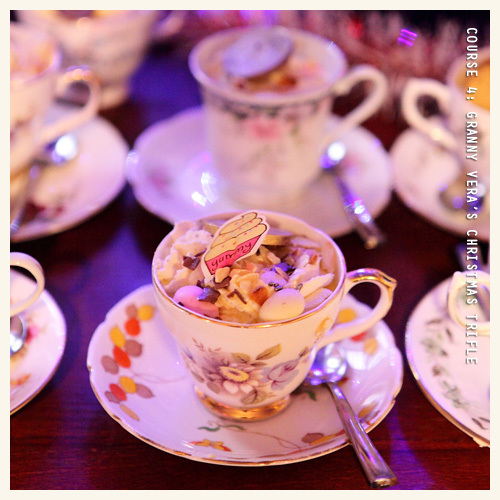 I served trifle in teacups to reflect the Honey Pie Tearoom ethos “there’s no mugs in Honey Pie! !” – Thanks Jo and all at Honey pie Tearooms. 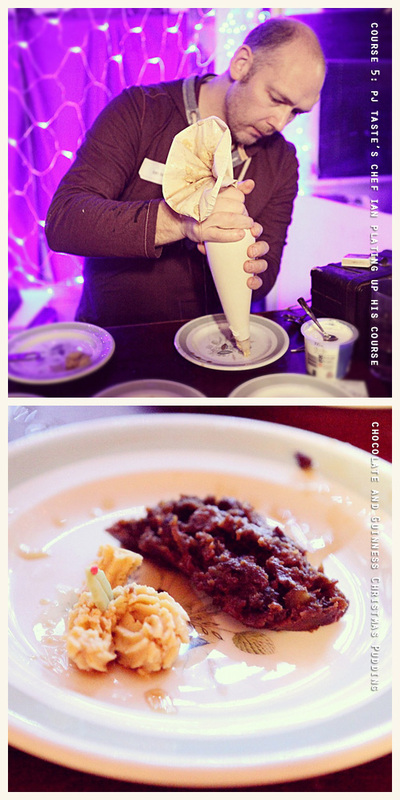 Finally, Course 5: Chocolate and Guinness Christmas Pudding with a single malt butter made by Chef Ian of PJ taste. So there you have it. Another Missie’s Pud Inn Club: Mission Completed! Sugar sweats or not, Sheffield’s sweet-tooth has definitely being pulled! A personal big thank you to all our pudding makers for the day’s treats – without their generous help, time and effort Pud Inn wouldn’t be possible – plus, not forgetting the Rutland Arms for being the ideal place to have Pud Inn. We have all made a contribution to Pud Inn in our own time for the love of a good pudding and to bring community together – now, who said community spirit was dead!? So who was voted diners favourite pudding I hear you ask? (drum rolls please…..) – Pudding number 3 made by the Rutland’s Chef Mike but Silversmith’s Chef Lee was coming very close behind Mike. Also, congratulations to our diner Tracey Howe (@traceyhowe75) for being our afternoon’s sweetest tweeter, who shared lots of fun pictures that embodied the fun and togetherness of #MissiesPudInn. Your complimentary Rutland Arms meal and drink voucher is on its way to you now. I’m sorry to those who weren’t able to purchase tickets to our Christmas Pud Inn and wanted to join. We had a lot of interest for this event and tickets were literally sold out within hours! I will be planning our next event very soon and hope you will be able to join me for that?